Ever feel like you’re running out of ideas for your content marketing campaigns? Content marketing is all about using content to attract and retain visitors, and eventually turn them into customers. And most people who use it know it’s effective. There’s just one problem: content marketing can be seriously hard work. According to Zazzle Media, 60% of companies struggle to produce content consistently, and 65% find it a challenge to produce engaging content. And not engaging your visitors means you’re losing money. If you’re running content marketing campaigns, day in, day out, it can be hard to consistently come up with new ideas and keep the momentum going. That’s why we’ve written this article. From blogging and social media to video and visual marketing, we’ve got a great collection of B2C and B2B content marketing examples to inspire you. These marketing examples from the business world will help you find new ways to get creative, and create your own inspirational content marketing to win leads and sales. Here’s a table of contents to help you jump to the content marketing examples you most want to see. When most people think of types of content marketing, they think of blogging as a starting point. Blogging helps you get visitors’ attention with helpful information, and provides content to flesh out your social media presence and fuel your SEO efforts, too. Here are a few examples of companies getting it right. Buffer’s one of our favorite content marketing examples, due to their three-pronged content marketing strategy. The company used guest blogging to fuel their initial growth, writing a couple of times a day and publishing content on high visibility sites. 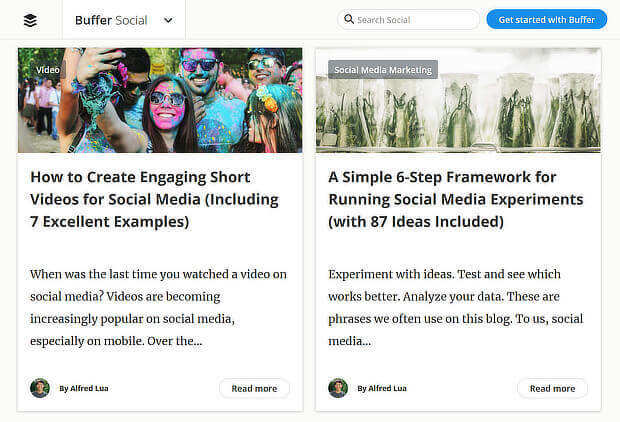 That growth hacking strategy helped Buffer attract their first 100,000 users. On Buffer’s own blog, the company concentrated initially on writing for the people who influenced their customers, producing high quality, and highly shareable, content. Buffer now has four blogs, including the Transparency blog and Open blog, where they have shared business ups and downs over the years. And they share their best content via a regular email marketing strategy. The results speak for themselves: Buffer is a highly recognized and trusted brand, with almost 400,000 users, and around a million followers across multiple social media sites. It must be working, because Hubspot is a multi-million dollar company. Rip Curl bills itself as the “ultimate surfing company”. One of the ways it shows that dedication is via an online publication known as The Search. 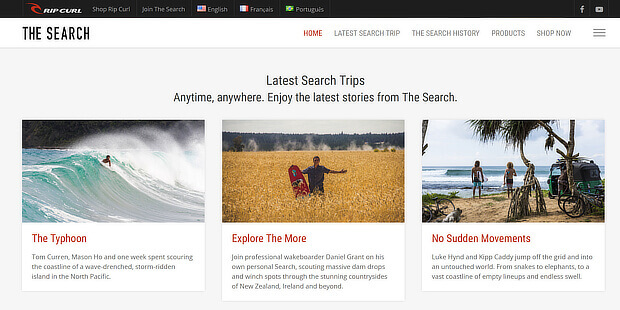 The Search chronicles surfers’ search for the best waves and the ultimate surfing lifestyle, and features great photography, and stories told by surfers for surfers. With more than 100,000 YouTube subscribers, and a whopping 2 million plus Facebook followers, this is a great example of matching content to your target audience to grow your business and make it profitable. As we mentioned in our guide to social media and SEO, social shares can help indirectly with search ranking, which in turn helps with lead generation. So it’s no surprise that many companies have focused social media content to wow their audiences. 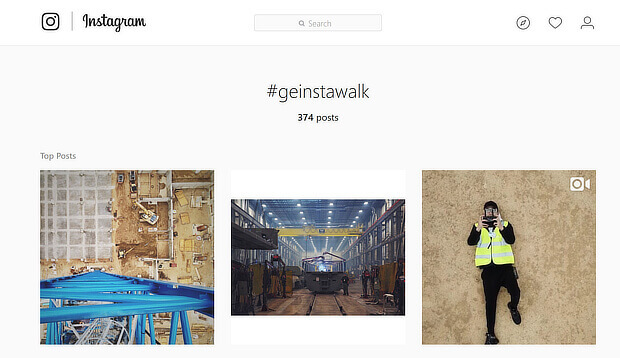 When you’re looking for inspiring B2B content marketing examples, GE is a great place to start. We’re not talking about washer-dryers and vacuum cleaners, but about the company’s other business: wind turbines, jet engines, locomotives and so on. GE’s long been known for taking what some might see as a dull business, and bringing it to life, and this Instagram content marketing campaign is a perfect example. And it was done without any paid advertising. We featured Glossier in our roundup of abandoned cart email examples. This time round, the company’s in the spotlight for using user-generated content to boost their brand on Instagram. Glossier also showcases its latest Instagram content on its homepage, as another way to attract its customers. With more than 1 million Instagram followers, the company must be doing something right. Intrepid Travel’s all about small groups, big adventures, and traveling responsibly. It supports that with a content hub called The Journal. In The Journal, you’ll find stories from real travelers sharing their experiences, which helps the company connect more with their core audience. 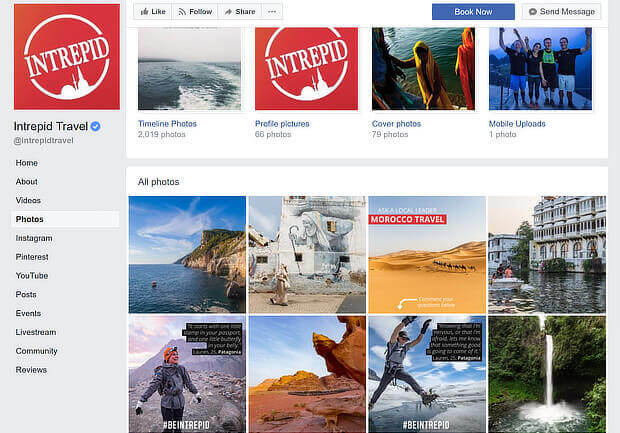 But another facet of Intrepid’s content marketing strategy is posting aspirational travel images from travelers on Facebook, interspersing that with its own content. That’s given the company nearly half a million Facebook followers, and strong communities on other social media sites. Our next content marketing example uses both publishing placements and social media to get the audience’s attention. Superdrug wanted to raise awareness around body image issues. 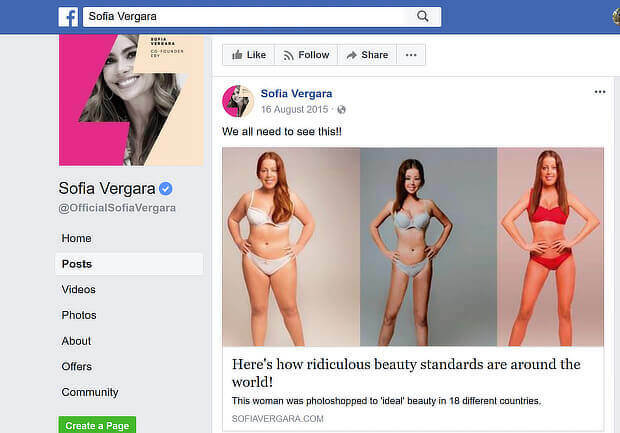 To do this, the company asked 18 graphic designers around the world to edit a photo of a model in Photoshop to bring it in line with their own country’s beauty norms. Plus the company got more than 700,000 page views to their site within a five-day period. Next, we’ve got a couple of content marketing examples that don’t rely on social media promotion. Anyone who’s read up on content marketing has probably heard of The Furrow, which is generally reckoned to be one of the first examples of content marketing. First published by John Deere in 1895, this publication aimed to help the company’s customers with the issues they faced, and show the company’s expertise at the same time. The amazing thing is that more than 120 years later, the publication’s still going, and is now also available online. Here’s another content marketing example that underlines the importance of knowing your audience and delivering the content they want. 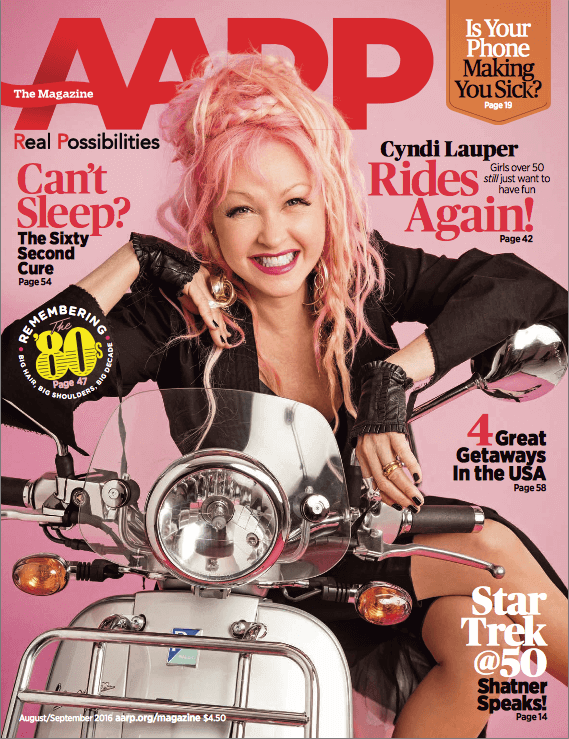 The AARP The Magazine has won awards for the quality of its content, design, and photography, but there’s nothing mysterious about their success. They listen to their readers, who reach them by email, letter, and social media, and use that information to determine the topics that will resonate with them most. It’s America’s biggest consumer magazine, going to 22 million households. In addition, more than half of its 37 million readers have read three of the last four issues. Images are the lifeblood of social media. Stone Temple Consulting shows that tweets with images have a 65% better chance of being retweeted. And Jeff Bullas found that including images in a blog post results in 94% more views. These next content marketing examples show how companies are using visual content marketing to increase visibility for their brand. Zomato is a restaurant finder mobile app available for 24 countries. The company uses humor liberally in its marketing strategy. 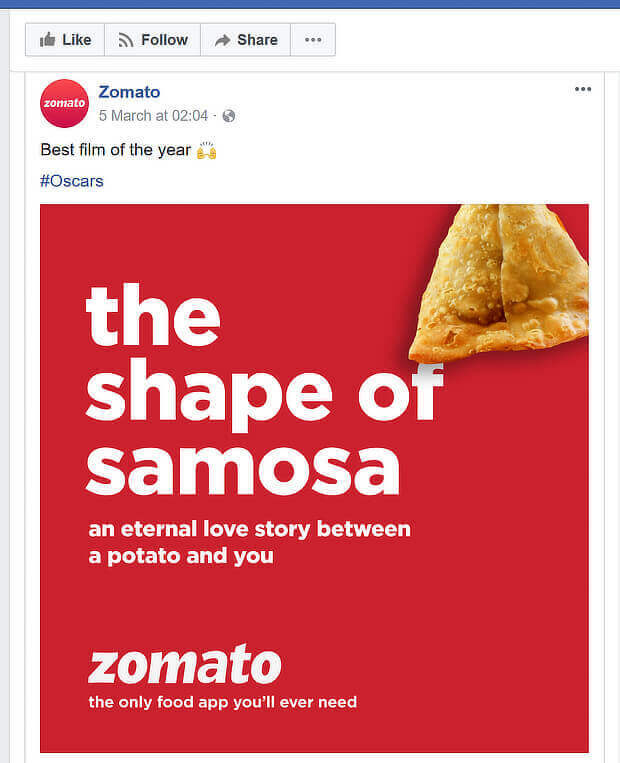 In particular, it creates and shares images referencing popular culture, as this recent example spoofing an Oscar-nominated film shows. They are simple, creative, and entertaining, proving that a minimalist approach can do the trick. It must be working, because the company’s got 1.3 million followers on Twitter, and the same on Facebook, and the app’s been downloaded hundreds of thousands of times. Shutterstock’s in the business of images, and it’s used its expertise to make a resource that everyone can use: a creative trends report. This capitalizes on the fact that people love reliable data, and this type of resource gets widely shared. Last year’s infographic attracted thousands of social shares, and attracted more than 6 billion site visits, according to the Content Marketing Institute. This year, Shutterstock has made the resource interactive, including not just images, but video and music. So far, it’s been shared more than 10,000 times. Just because you’re an iconic brand, it doesn’t mean you can’t totally rock content marketing. Rolex proves this by conveying the quality and timelessness of its brand through excellent photography which radiates quality. 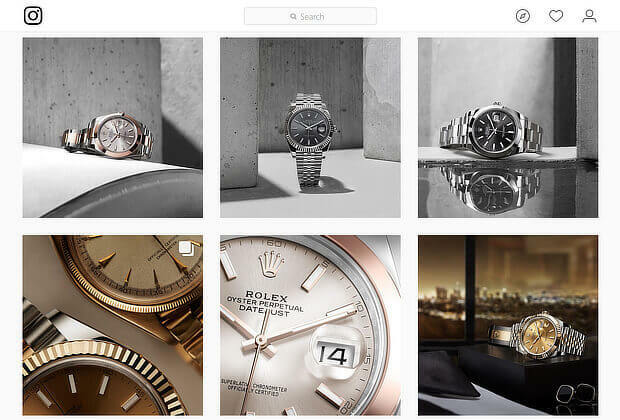 And the fans love it: Rolex has more than 7 million Instagram followers, and around 6.6 million on Facebook. Video marketing drives brand awareness, leads, and sales, so it’s no surprise that so many of our content marketing examples include videos. Let’s start with Blendtec, whose viral videos prove there’s no such thing as a boring industry – if you can tap into what hooks your audience. Blenders might not sound that interesting, but they become a heck of a lot more so when you put weird stuff in them. The Will It Blend video series put the company on the map, and resulted in a 700% increase in sales in a three-year period. Today, Blendtec’s YouTube channel has more than 885,000 subscribers, and the campaign’s still going strong, with videos regularly attracting hundreds of thousands of views. When you’re launching your content marketing strategy, it never hurts to tap into popular culture – and one of the most popular shows in recent years has been Game of Thrones. 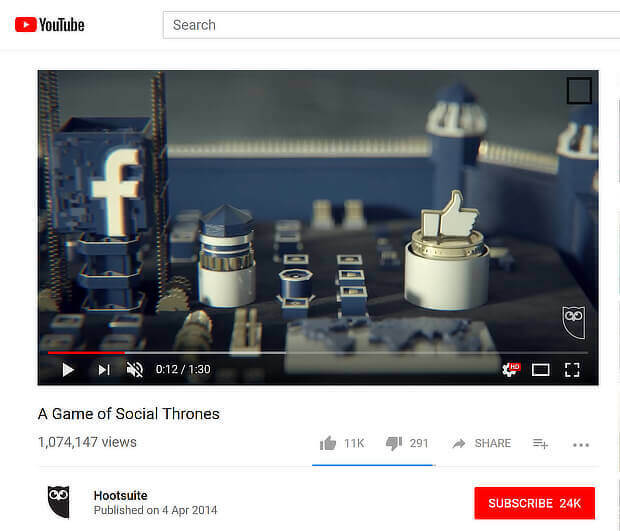 Hootsuite used this as a jumping off point to tell a relatable story about their brand via a video titled A Game of Social Thrones. This video has now had more than 1 million views, and is their most successful branded content. Here’s one of the coolest content marketing examples from the business world, where Zendesk jumped on something that could have gone against them, and showed their brand values and personality at the same time. Whenever you offer a product or service, there’s someone searching for an alternative. When Zendesk realized people were searching for Zendesk alternatives, they basically hijacked the keyword phrase, creating a mini-site and video optimized around it. The result? A page one spot for that keyword phrase, and a heck of a lot of goodwill! For a brand that’s been around since 1937, Old Spice is doing great at staying in touch with its market. Nine years ago, the brand was losing ground to its competitors, when someone had a cool idea: jettison the old world image in favor of something – or someone – new, young and hot. It worked. In a series of videos and ads delivering humor and in some cases never mentioning the brand, Old Spice changed its image to become relevant for a new generation. The original ad has had more than 55 million views, and Old Spice is still using this approach with a new series of promotions, targeting teenage boys and their mothers. JetBlue’s one of the world’s leading airlines, and it’s never been afraid to get creative with content marketing. In particular it’s used video to inspire its audience, and to show off its brand values and personality. 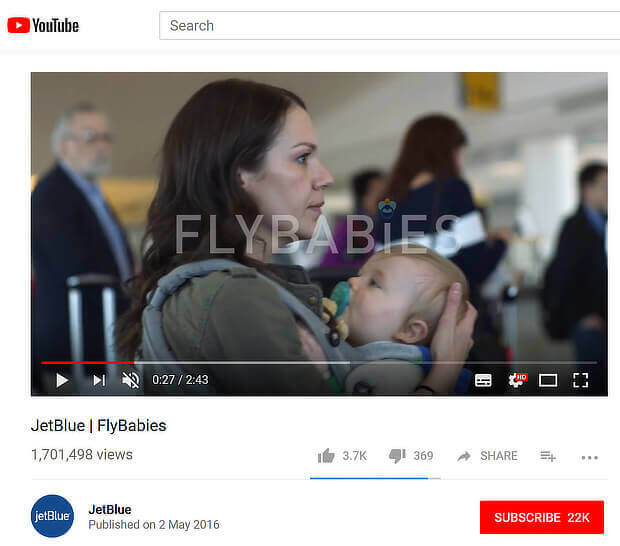 Recent examples include the Reach Across the Aisle campaign, which encourage people to find out what united them, a series on flying with infants, and the quirky Flight Etiquette video series. Video views on YouTube ranges from tens of thousands to millions, while the perception of the brand remains overwhelmingly positive. As we saw earlier with Hubspot, ebooks and resources are a great way to raise awareness of your brand. 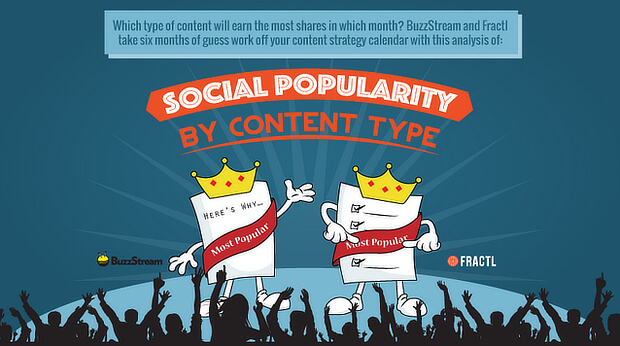 Here are a couple more examples of this type of content marketing. If you want to know how to use LinkedIn effectively, nobody’s going to be more expert than LinkedIn itself. That’s why the company’s ebook on its own approach to marketing with LinkedIn is such a winner. The landing page whets customers’ appetites with a series of tips and stats, and most LinkedIn users will want to opt in immediately. LinkedIn has continued to use this strategy by producing more marketing guides, so it’s a sure bet it’s working for them. One of the best B2B content marketing examples is from Simply Business, a UK insurance firm that’s known for producing a series of useful tips and guides. It’s yet another example showing that so called “boring sectors” can still wow their audience. 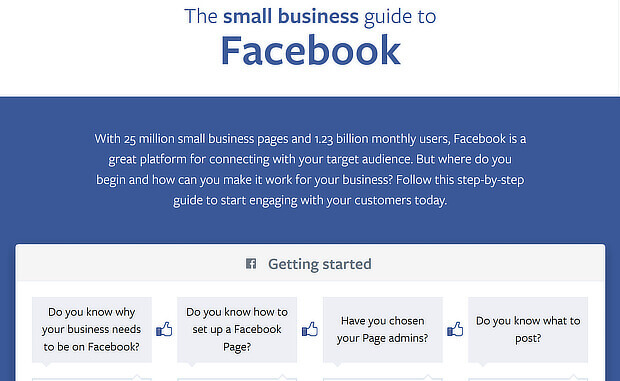 Their customer education guides have attracted thousands of links and shares, as well as raising their profile. Finally, here are some content marketing examples from the business world that are a little bit different. 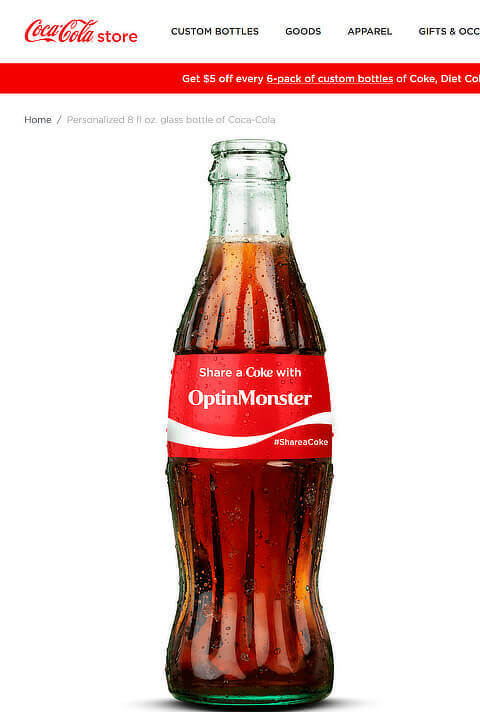 Coke used personalization to get everybody talking about their brand. They kicked off their Share a Coke campaign in Australia by putting the 150 most common names on bottles. Then they encouraged people to share a Coke with people with those names. That campaign went viral, resulting in sales of 250 million bottles and cans across the summer, or equivalent to just over 10 for every person in Australia. Unsurprisingly the campaign soon rolled out to other locations. You can now customize your own bottle, as we did here. Data analytics is another area that could be seen as dry, but when Grant Thornton ran their Access Granted campaign, it was anything but. The company took people behind the scenes at the Tony Awards, showing exclusive content on YouTube and Twitter. That resulted in 3.7 million Twitter impressions, increased Facebook reach, and beating their goals for YouTube goals by 115%. This content marketing example from Charmin is perfect for its customers. The brand’s always had a sense of humor in its TV ads, and that’s carried through to the Sit or Squat app. This app aims to help people find clean bathrooms when they need them, so it’s also pretty practical. So far, the app’s been downloaded more than 100,000 times, and nobody’s going to forget the brand. Burberry’s most outstanding content marketing campaign was Burberry Kisses, blending mobile technology with the human wish to connect with others. Via an app, users could press their lips to the screen and send a digital kiss to anyone. The campaign also allowed people to use Google Street View and Google Maps to see the journey those digital kisses took. Buzzstream combined a number of content types (research heavy guest content, evergreen blog content, and gated content) to attempt to position itself as a thought leader within its industry. The nine-month content campaign was hugely successful, resulting in a record-breaking number of new signups. Lush combines a range of content marketing techniques to reach its audience, which is why it’s hard to put it in just one category of content marketing examples. From its quirky product names to its well known ethical values, the brand already resonates with its core audience. But it doesn’t stop there. Its videos go behind the scenes of the making of its products, while on social media, Lush encourages users to share and hashtag photos of its products in use – or at least about to be used. 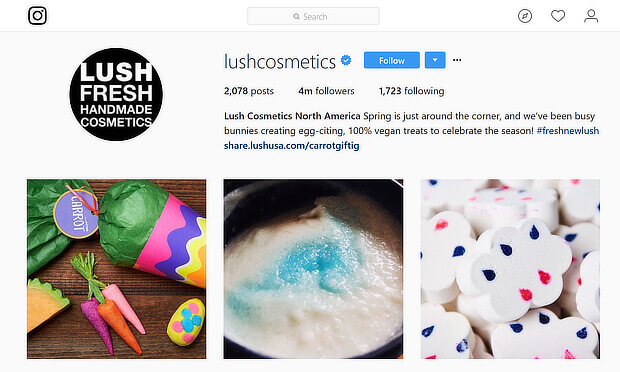 Instagram is one of its key platforms, with the main Lush account attracting 4 million followers. With these content marketing examples, you’re all set to wow your visitors with fresh, new ideas. Next, use these copywriting templates to get started, or see how you can improve your content marketing ROI. But there’s one final thing to remember. There’s no point building an audience if they don’t convert. And that’s just the start. Check out OptinMonster’s other features and see how it could help you get more from content marketing. And don’t forget to follow us on Twitter and Facebook for more in-depth tips and guides. Content marketing is necessary for newbie bloggers, as it benefits in link building, more traffic generation, developing a reputation among the other blogs and also it is very helpful from SEO point of view. Content marketing, in my opinion, is the next big thing for B2B business growth. It benefits in trust building with the audience, traffic generation and higher chances of those leads generating qualified business. I kinda relate to your thinking about how content marketing increases sales. Thanks for the instructive page.